Longform journalism was feared to be one of the first casualties of the digital age as the news industry struggled to adjust to falling advertising revenues and the rise of social media. But recent years have seen a rise in new approaches to digital storytelling, harnessing all the multimedia elements made possible by the internet to give readers an experience traditional platforms of print, radio or television would not be able to provide alone. At the BBC, features editor for BBC News Online, Giles Wilson, has been central in commissioning the broadcaster's recent spate in longform, immersive stories – from mysterious Icelandic murders, to the horror of the Rwandan genocide and the iconic history of Rio de Janeiro's Christ the Redeemer. At a workshop to showcase the immersive publishing application Shorthand, used by the BBC to create each of the above stories and more, Wilson shared his advice for best-practice in commissioning, planning and producing such content. "It's very hard to give a clear definition of what works and what doesn't," said Wilson, but a good starting point would be to look for a "character or situation that is in flux". Choosing a subject area is the very start of the process, the "vaguest of ideas", he said, and it is only when the crucial element of a story has been found that work can begin in deciding how to tell it. The New York Times's Pulitzer Prize-winning, multimedia epic Snow Fall – which Wilson jokingly refused to name, referring to it only as "the American story" – provoked an avalanche of praise and imitations, but few people managed to finish it, he said. So it is vital to decide the scale of the project from the beginning and not get carried away with the possibilities that the limitless expanse of the internet can provide. "As an editor you need to arm yourself with all the facts about what's the right thing for your own site's audience," he said. "How long do they normally spend on stories? How large a chunk of their day can you expect them to give over to you? My hunch is that it's not as long as you'd think, or you'd like it to be." Snowfall peaked at 19,000 words, while two of the BBC's most popular immersive stories, The Reykjavik Confessions and Arms Wide Open, totalled 6,000 and 3,000 words respectively. "So it doesn't have to be massively long," he said, "it just has to be good." "It's possible you might have a Renaissance journalist who will find the story, do the research, do the interviews, the filming, photography and stitch it together with the right narrative arc and editorial authority," said Wilson. "It's possible that you have someone like that but more likely not. In our experience you need teams." 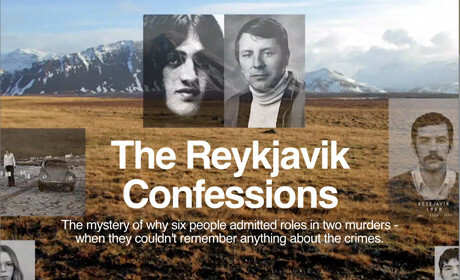 For 'The Reykjavik Confessions', a 6,000 word investigation into two mysterious murders in the 1970s, Wilson sent a three-person team of an investigative journalist, radio producer and video producer to gather the relevant elements for the story over the course of a week. "We didn't know how much time it may take," he said, "but knew it could make quite a rich novelistic style piece." The BBC had already decided the story would run on Radio 4, but knew they would not be able to go back and catch-up on tracking shots or other visual elements which Wilson said play a key role in creating an air of drama in the story. "You want a storyteller to know how these things are going to weave into the story," he said, "one brain seeing the story from beginning to end." Although they may not be able to do everything themselves, the central author should know how multimedia elements can feed into the story, while videographers or designers may be more suitable in the framing of video or artistic direction. 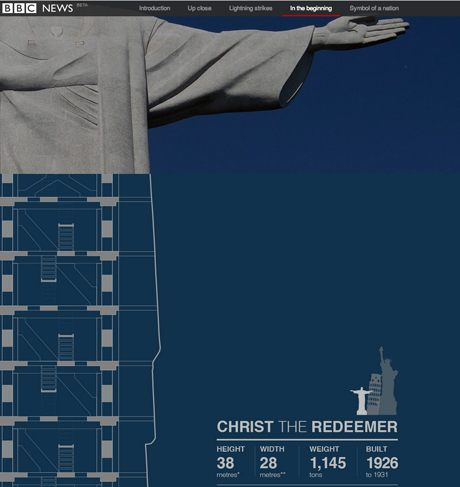 Screengrab from the BBC's Arms Wide Open feature about the Christ the Redeemer statue in Rio de Janeiro. Scrolling through the story revealed the graphics and stats on this page, an element Wilson said was popular on social media. Alongside the slow-tracking, cinematic shots of a snow-strewn wilderness which characterise the chapter headings of 'The Reykjavik Confessions', video interviews slot neatly between the text. The aim was to make the transition seamless, said Wilson, by posing a question in text that would then be answered in video, or a direct quote that would be continued by the speaker. "Is the video there as illustration, or is it part of the storytelling?" Wilson asked. "You don't want to see the join. You want it to be a true multimedia experience where you don't see the join between the text and the video." Where video is concerned, the need to "remove as many barriers and obstacles" in how the stories are told should be central in how the different elements are compiled, he said, to maintain readers' interest. A more recent immersive story about Shinji Mikamo, a survivor of the Hiroshima atom bomb, also featured video but had much lower viewing figures, said Wilson. Archive footage detailing the violent force of a nuclear explosion comprised the first video, coming directly after Mikamo's testimony of his experience, but less than ten percent of readers watched the video, Wilson said. "Video is still a work in progress about what the best approach may be," he said, but structure plays an important role in how a reader may interact and how long they may stay in a story, to the point where storyboarding can be effective in deciding the visual lay out. "Our enemy here is the whole of the internet, where it's all organised to grab your attention," Wilson said. As such, every element of a story – text, audio, video, animation, parallax scrolling – must serve a purpose in elevating and enhancing the storytelling process at hand.